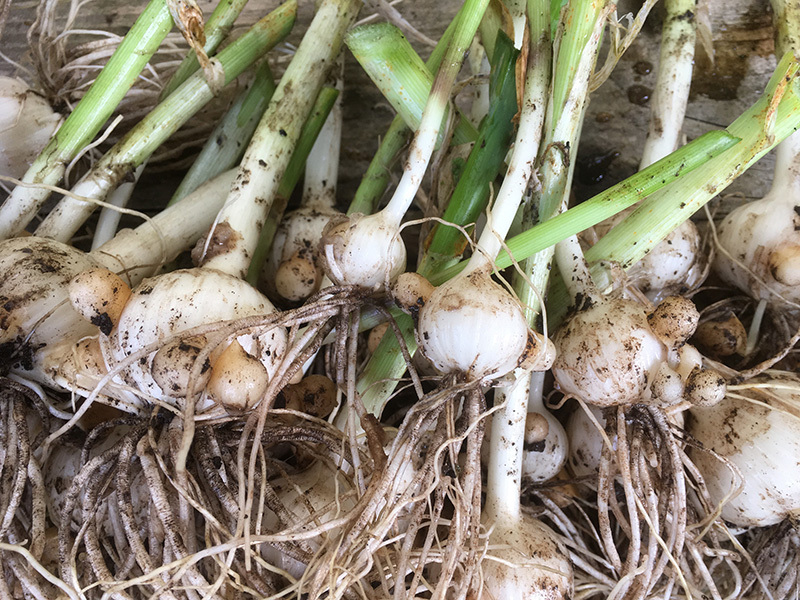 Babington leeks are one of the tastiest, low maintenance and easy to grow perennial vegetables providing a yearly harvest of slender leeks with a hint of garlic. Supplied as 10 dried individual bulbils (seeds) – each bulbil will produce a leek plant. They can be sown direct or can be sown in pots and transplanted later when signs of shoots appear. Sow any time between autumn and spring. 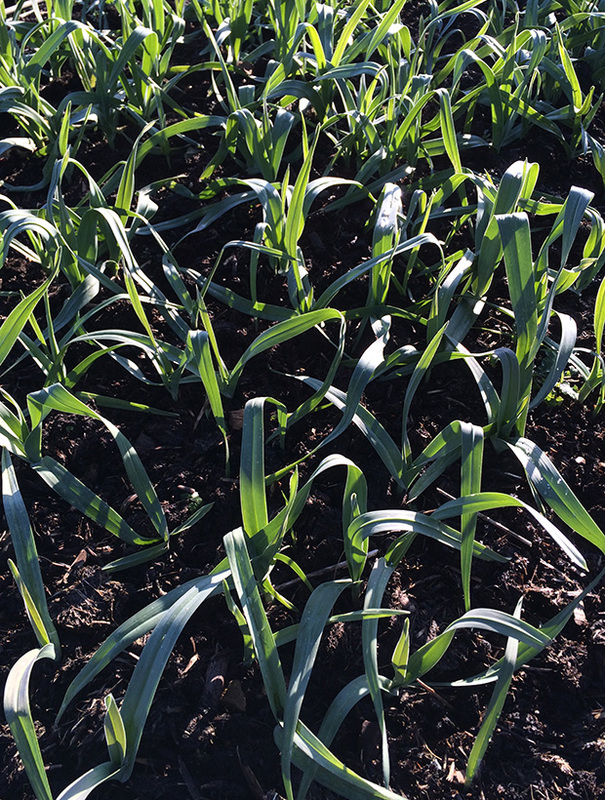 Babington leeks can be harvested by cutting the leek at the base and leaving the bulb in the ground to re-grow. They can emerge any time between early winter to early spring depending on your climate and location. Very hardy. Full growing instructions below. We also have Poireau perpetuel perennial leeks in stock. Babington leeks, Allium Ampeloprasum var Babingtonii, is one of the tastiest and easy to grow perennial vegetables. Named after Charles Cardale Babington, this wild and hardy perennial leek is a native sea shore plant and perennial ancestor to garden leeks. It is extremely low maintenance and ideal for polyculture spaces as it will thrive between other plants and can tolerate a range of soils and positions. Sow any time between Autumn and spring. When your bulbils arrive you can sow direct about 2cm deep allowing 8-10cm space between each bulbil. 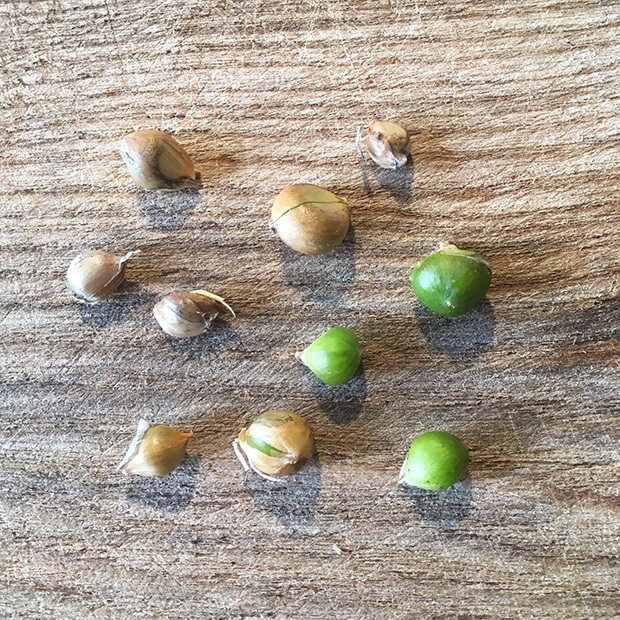 Alternatively you can sow the bulbils in a roomy pot and just leave outside, when tips emerge, you can carefully separate out the sprouted bulbils and plant them as above. If sowing direct, mark where you have sown them so you can look out for growth appearing. The first appearance of Babington leek shoots can vary depending on your local climate and region from early winter to early spring. 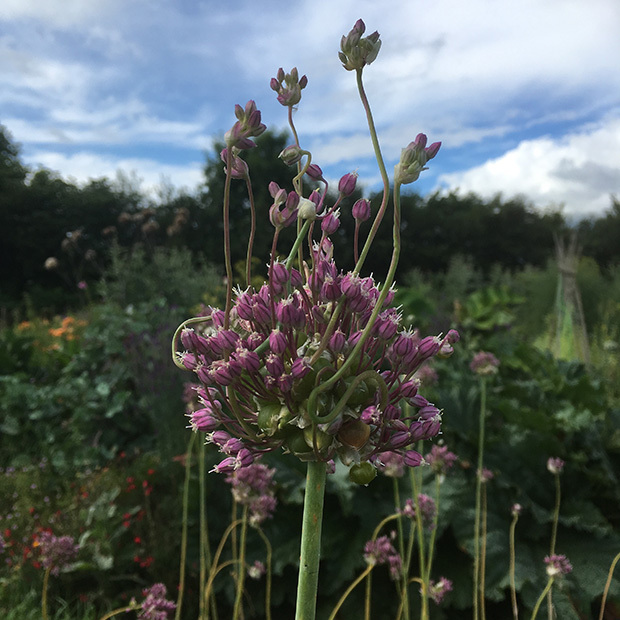 Babington leeks are so tasty that you will want to harvest them all, but if you want to increase your stock quickly you need to let some of them flower. The leeks will throw up a very tall stem around July time with very attractive purple flowers. These in turn go on to produce a head of bulbils, each bulbil producing a new leek. The head will naturally bend and plant itself or you can gather bulbils and separate them when the cases are papery and sow in a new spot. 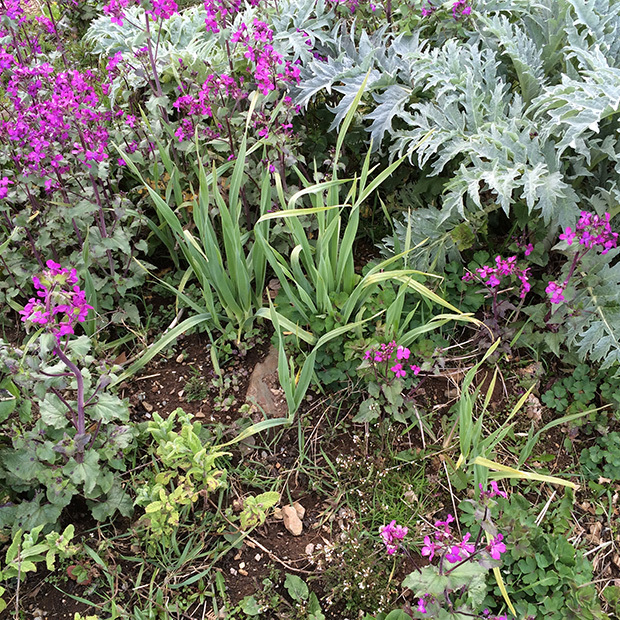 As the plants mature, they produce a very large underground bulb with a cluster of ‘mini bulbs’ or offsets which will form clumps of new growth above ground. You can lift and separate and move bulbs around when they are in their dormant stage. 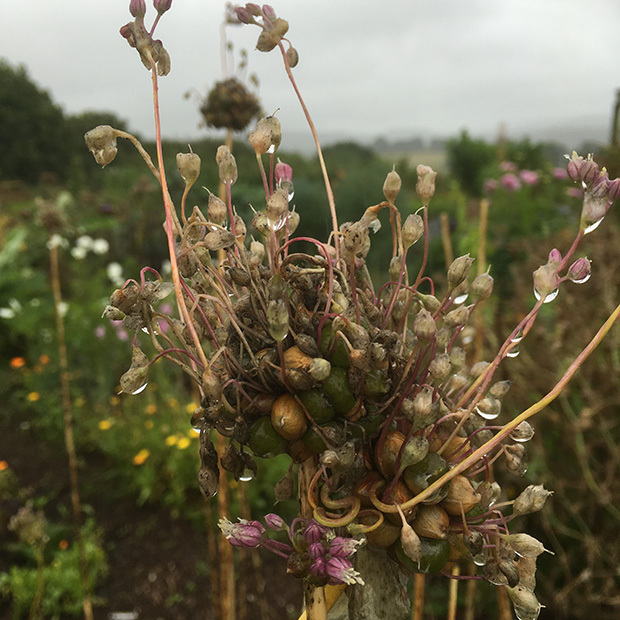 You will find leeks popping up in strange places as bulbils sometimes get flung a distance, but it is exciting when that happens! It takes patience to establish a Babington colony, but well worth it and you will have them forever. The life cycle of the leeks is: Emerge in early winter, harvesting period March to June, flowers emerge July to August ( from plants that have not been cut for harvesting), heads of bulbils can be collected in August, plants then go into a period of dormancy and all top growth will disappear until moisture returns. As each year passes the underground bulbs become larger. Timing of growth/flowering cycle may vary according to your location and temperature. Sometimes the heads of bulbils will not form until the second year. 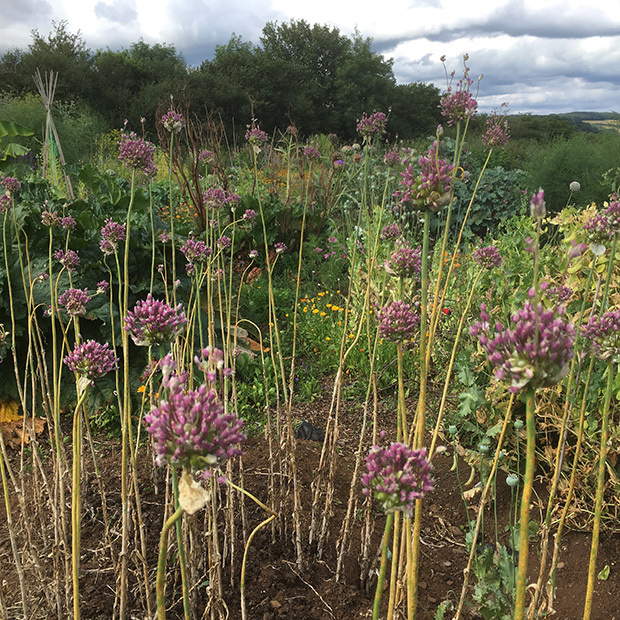 Babington Leeks – flowers, stems, bulbs and bulbils are all edible. The leeks have a deep savoury taste and make the most delicious base for soups, are great in omelettes, or just simply sautéed in a pan. They have a garlicky hit too which just adds to their many culinary uses.